Like the police captain in “Casablanca” feigning outrage at gambling in Rick’s Café before being handed his winnings, France was “shocked, shocked” to find that the Libyan generalissimo whose forces it has covertly helped arm and train was marching on Tripoli, like reported by politico.eu. The timing of Field Marshal Khalifa Haftar’s offensive earlier this month against the U.N.-recognized unity government of Prime Minister Fayez al-Sarraj — just as the United Nations secretary-general was in town to prepare for a long-delayed peace conference — may indeed have embarrassed Paris. But Haftar’s intention to seize, rather than share, power can have come as no surprise. Paris has been quietly involved at least since 2015 in building up the flashy uniformed baron of Benghazi as a strongman it hopes can impose order on the vast, thinly populated North African oil producer and crack down on the Islamist groups that have flourished in the ungoverned spaces of the failed state. In doing so, it has trampled none too subtly on the economic and security interests of its EU neighbor Italy, the former colonial power in Libya and the main foreign player in its oil sector. Rome has endured an influx of hundreds of thousands of refugees and economic migrants across the central Mediterranean since a French-driven NATO air campaign toppled dictator Muammar Gaddafi in 2011, leaving post-war chaos in his wake. France ostensibly supports the U.N.-mediated peace process, led by former Lebanese Culture Minister Ghassan Salamé, a veteran Paris-based political scientist. It has never officially acknowledged providing weaponry, training, intelligence and special forces assistance to Haftar. The death of three undercover French soldiers in a helicopter accident in Libya in 2016 provided a rare recognition of its secret presence in operations against Islamist fighters at the time. For his part, Haftar — a U.S. citizen and an allegedly CIA-trained estranged Gaddafi ally supported by an alliance of the United Arab Emirates, Saudi Arabia and Egypt as well as Russia — has made little secret of the modern French weaponry he has acquired despite a U.N. arms embargo. Some of his followers are not exactly the secular warriors that Paris might wish. “Aside from a military core, the motley forces that Haftar oversees are comprised of tribal militias, hard-line Salafists linked to Saudi Arabia, Sudanese rebels and one commander wanted by the International Criminal Court for alleged war crimes,” said Mary Fitzgerald, a researcher on Libya. That hasn’t stopped France from giving him a leg up politically. One of President Emmanuel Macron’s first high-profile diplomatic initiatives upon winning office in 2017 was to invite Haftar and Sarraj to a chateau outside Paris to try to broker a power-sharing deal. He didn’t bother to involve the Italians. After all, this was part of a blitz of summitry to show that France was back on the international stage. Foreign Minister Jean-Yves Le Drian, who in his previous role as minister of defense was the architect of the “back Haftar” strategy, at odds with foreign ministry experts, seems to have convinced the young president that Libya is low-hanging fruit. Italian officials insist they understand Libya’s complex social dynamics better and contend that Haftar will not be able to command the loyalty of the Toubou and Touareg tribes that dominate southern Libya or the multiple localized factions in the northwest of the country. Critics of France say potential “winnings” in reconstruction contracts and increased business for oil major Total provide one motive for its Libya policy. Haftar, who controls eastern Libya from his stronghold outside Benghazi, grabbed key oilfields operated by Italy’s Eni in the south earlier this year before turning his guns on the capital. A senior French figure familiar with government policy said support for Haftar is partly driven by the imperative of stanching the supply of arms and funds to jihadist groups threatening fragile governments in Niger, Chad and Mali, which are backed by France’s Operation Barkhane. 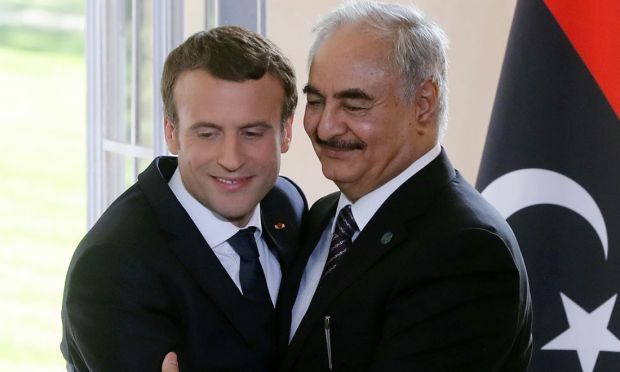 But the French official said Paris’ love for the Libyan strongman is far more about strategic alliances across the wider Middle East than commercial considerations. Paris is aligned with the Emirati, Saudi and Egyptian rulers, to whom it has sold billions in weapons, against a looser alliance of Qatar, Turkey and the transnational Muslim Brotherhood movement that briefly governed Egypt before being ousted in a military coup in 2013. French policymakers connect this regional struggle with their fight against Islamist insurgency in the Sahara-Sahel belt and terrorism at home, their No. 1 national security priority, especially since the November 2015 Paris attacks that killed 130 people. After the instability unleashed by the Arab Spring uprisings, the dominant view in government circles in Paris is that strongman solutions are the only way to keep a lid on Islamist militancy and mass migration, and tant pis (tough luck) for human rights and democracy. That’s why the French are looking on in anxiety at events in Algeria, their former colony and a major gas supplier, where ailing President Abdelaziz Bouteflika, 82, was forced to resign after 20 years in power by mass pro-democracy protests that have not abated despite army warnings. Bouteflika’s fall points to why Paris’ strategy is a risky one. Haftar is no spring chicken. He is 75, underwent six weeks of medical treatment in France last year and has no clear successor, although he has appointed his sons to key positions. And he’s not doing too strongly as a strongman either. “He wanted to walk into Tripoli without a bloodbath as a national savior from the militias but it hasn’t worked out that way,” said Arturo Varvelli, head of the Middle East and North Africa center at the Italian Institute for International Political Studies in Milan. The assault on Tripoli encountered tougher resistance than Haftar had anticipated. Militias have not switched to his side. Scores of people have been killed and thousands have fled. Libya may face another prolonged bout of fighting rather than a swift takeover. Quite apart from the damage to Libya and Libyans, it’s hard to see how that would help France fight either terrorism or uncontrolled migration.